A medium-sized area of modern Pembrokeshire, comprising the upland moorlands of Mynydd Melyn and Cnwc-y-gwartheg. It lies within the medieval Cantref Cemaes. Cemaes was brought under Anglo-Norman control in c.1100 by the Fitzmartins who retained it, as the Barony of Cemaes, until 1326, when they were succeeded by the Audleys. The Barony was coterminous with the later Hundred of Cemais, which was created in 1536, but many feudal rights and obligations persisted, some until as late as 1922. This character area is a typical Welsh upland landscape in that it contains extensive evidence for prehistoric occupation, mainly ritual and funerary monuments but also occupation sites such hut groups and field systems. 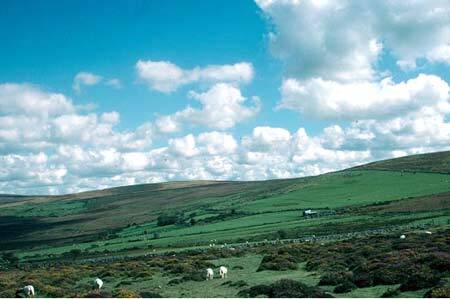 By the medieval period Mynydd Melyn and Mynydd Carningli to the east probably formed a single block of open moorland. 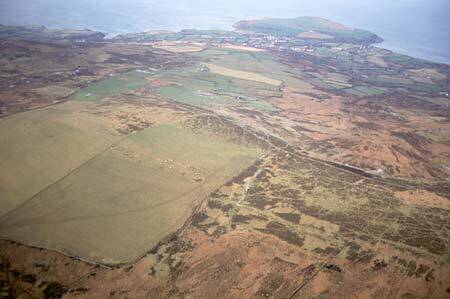 Mynydd Carningli, including at least part of Mynydd Melyn, was held directly by the Lords of Cemaes, but in 1278 Nicholas Fitzmartin issued a charter granting the burgesses right of common grazing over ‘all my land wet and dry, moors and turbaries’ on Mynydd Carningli. The charter defined a large area including that lying to the west of Mynydd Melyn and north of the arable holding of Nantmarchan, which represented one knight’s fee. This lay along Cwm-mawr to the south of Mynydd Melyn. The west half of this area was divided between Dinas and Llanychlwyddog parishes, the division between them may be an ancient boundary. That part of Mynydd Melyn in Llanychlwyddog parish, also appears to have been unenclosed land but belonged to a larger holding, also called Mynydd Melyn, of mixed land running down the slope to the south of this area. It represented one knight’s fee held of the Barony, with its centre at the farm of the same name lower down the slope, and is recorded in the Extent of Cemaes of 1594. It would seem therefore that in the medieval period Mynydd Melyn was a mixture of open common and unenclosed land held by individual farms. However, right of common appears to have extended over the whole of the area during the post-medieval period as an estate map of 1758 names part of the area as ‘sheepwalk’ belonging to several farms on the lower, northern slopes, although it is unclear whether this ground had a perimeter fence or was unenclosed. However, by the tithe survey of c. 1840s the higher levels (which lie in this historic landscape character area) had been divided into large fields, in a pattern similar to that of today, and farms and fields had been established over the lower slopes in what is now a neighbouring area. Very little seems to have altered in this area since the tithe survey. This is an upland historic landscape character area that achieves a height of 307m on the rounded peak of Mynydd Melyn. There are no buildings in this landscape. It has an open aspect, but it is not open moorland, and is divided into very large enclosures. Older boundaries consist of stone-faced banks and dry-stone walls. These are now largely redundant, and wire fences, many of which run along the older boundaries, form stock-proof barriers. It is treeless. Land-use is a mixture of improved pasture and rough, heather grazing. Archaeological sites are an important historic landscape component of the area, particularly prehistoric sites, including: hut circles, a round barrow, a standing stone, clearance cairns and field systems. Other sites include a medieval pilgrims cross. 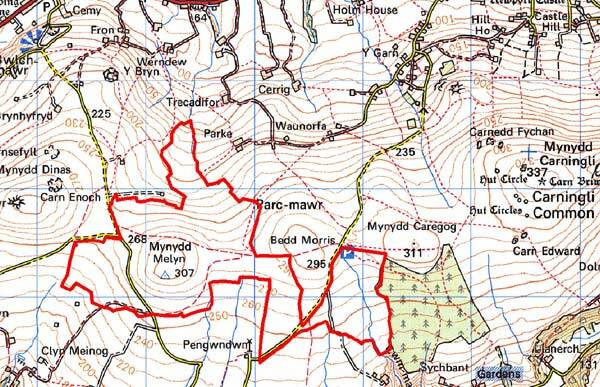 Mynydd Melyn is a distinct historic landscape character area, yet its boundaries cannot be defined with great precision. There tends to be a gradual merging of this area with the rougher fields of the neighbouring areas.